Wow! It's Thursday already?!? That means it's Theater Thursday! This week we're looking at The Negotiator. If you haven't seen this movie, grab your keys. Lock the dog up and drive to the nearest store and buy this movie. 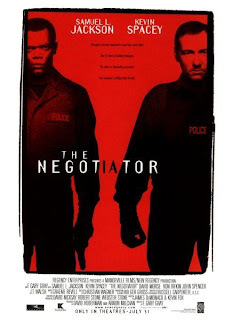 The Negotiator is one of the best drama/cop movies of the late 90's/early 2000's. Kevin Spacey & Samuel L. Jackson did an awesome job. I love both of them so seeing them together on the big screen was great. Basically, this movie takes place in Chicago, IL. Samuel L. Jackson plays a Chicago negotiator who is thrown under suspicion for crimes he claims he did not commit. Kevin Spacey gets called in to negotiate, the negotiator's hostile situation. It's gripping and moving This movie is not a comedy so be warned. If your not in the best emotional place then avoid this movie at all cost! Haha! The countdown is still progressing, less than a week to go! Thursday?! Really? I can't believe it! I can't say I've ever seen this. It looks interesting though. Yeah, I've not watched this one either, like shoshanah said...But I heart Samuel L. Jackson! This movie was excellent! Both Kevin Spacey and Samuel did a great job in this movie! Thanks for the living room props! You're so sweet!